Huge columns of smoke rise up from the myriad of fires in the Fort McMurray complex in Alberta, Canada. NASA’s Suomi NPP satellite collected this natural-color image using the VIIRS (Visible Infrared Imaging Radiometer Suite) instrument on May 16, 2016. 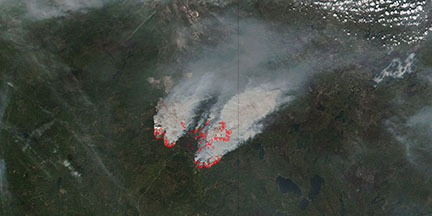 The actively burning areas are outlined in red. NASA image courtesy Jeff Schmaltz LANCE/EOSDIS MODIS Rapid Response Team, GSFC. DoG enews is on a semimonthly schedule for the summer. Josh Inwood is officially our newest associate professor hire. He is the Geography of Global Ethics co-hire with the Rock Ethics Institute and specializes in Cultural Geography, Qualitative Methods, Critical Race Theory, and Urban Geography. Clio Andris’s Friendly Cities Lab project to safely and creatively dress up city municipal buses is a winner with the Knight Foundation 2016 Emerging City Champions fellowship program. Applying a suite of geographical information system (GIS) tools can improve monitoring for elephant poaching, according to Penn State researchers. Investigating Tsavo, a region in southwest Kenya that is home to that country’s largest elephant population, the researchers tried to identify methods that local conservation groups could use to reduce poaching. Brent Yarnal, professor of geography at Penn State since 1985, has announced his retirement at the end of the 2015–16 academic year. Yarnal’s research portfolio has focused mainly on the integration of issues surrounding climate change, natural hazards, and the use of environmental information in decision-making. Some of his recent work has included community vulnerability to present and future hurricane storm surge, local greenhouse gas emissions and climate action planning, and the role of climate information and perceptions in water resource management. Penn State graduate students Sarah Eissler, Annie Marcinek and Nari Senanayake have been recognized with the 2016 Whiting Indigenous Knowledge Research Award to help fund their research pursuits. The award, open to all full-time Penn State undergraduate and graduate students, is funded by the Marjorie Grant Whiting Endowment for the Advancement of Indigenous Knowledge and supported by Penn State’s University Libraries and the Interinstitutional Center for Indigenous Knowledge (ICIK). As many students leave University Park for the summer, Penn State’s Office of Physical Plant (OPP) enters another season of construction and renovation to improve the campus. OPP will be providing more detailed information about multiple summer projects over the coming months. OPP, the Parking Office and project contractors will work to minimize disruption to the campus community, but the public should expect many temporary route changes and interruptions throughout the summer. An interactive construction map that identifies summer projects is available on the OPP website. Micronutrient deficiency remains a serious problem in Indonesia with approximately 100 million people, or 40% of the population, suffering from one or more micronutrient deficiencies. In rural areas with poor market access, forests and trees may provide an essential source of nutritious food. This is especially important to understand at a time when forests and other tree-based systems in Indonesia are being lost at unprecedented rates. We use food consumption data from the 2003 Indonesia Demographic Health Survey for children between the ages of one and five years and data on vegetation cover from the Indonesian Ministry of Forestry to examine whether there is a relationship between different tree-dominated land classes and consumption of micronutrient-rich foods across the archipelago. Quantifying historical fire regimes provides important information for managing contemporary forests. Historical fire frequency and severity can be estimated using several methods; each method has strengths and weaknesses and presents challenges for interpretation and verification. Recent efforts to quantify the timing of historical high-severity fire events in forests of western North America have assumed that the “stand age” variable from the US Forest Service Forest Inventory and Analysis (FIA) program reflects the timing of historical high-severity (i.e. stand-replacing) fire in ponderosa pine and mixed-conifer forests. Land cover and its change have been linked to Buruli ulcer (BU), a rapidly emerging tropical disease. However, it is unknown whether landscape structure affects the disease prevalence. To examine the association between landscape pattern and BU presence, we obtained land cover information for 20 villages in southwestern Ghana from high resolution satellite images, and analyzed the landscape pattern surrounding each village. Master of Geographic Information Systems (MGIS) and Master of Professional Studies in Homeland Security: Geospatial Intelligence Option (iMPS-HLS) students traveled to University Park Campus from California, Delaware, Florida, Georgia, Maryland, Pennsylvania, and Virginia. 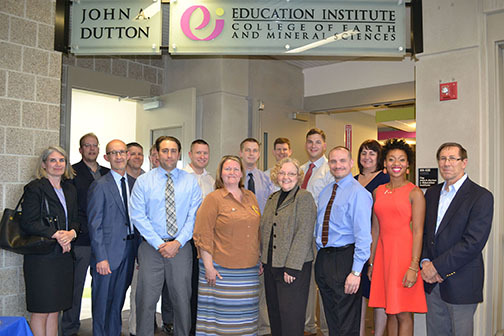 Before attending graduate commencement at Bryce Jordan Center, they attended a reception with their families at the Dutton e-Education Institute. DoG enews will go to a semimonthly schedule for the summer. Yanni Cao was nominated to represent the College of Earth and Mineral Sciences to attend Chinese Student Presidential Reception on April 27, 2016. She shared her experience as an international student at Penn State and a researcher at National Center for Atmospheric Research with President Barron. Brent Yarnal, professor of geography since 1985, has announced his retirement at the end of the 2015–16 academic year. Probing Question Video: How can coastal cities prepare for increasing storm surge? What happens when a hurricane makes landfall and brings with it a deluge of deadly water? The storm surge in a hurricane is arguably the greatest threat to lives and one that is often ignored. Brent Yarnal, professor of geography in Penn State’s College of Earth and Mineral Sciences, researches the vulnerability of coastal communities to contemporary hurricane storm surge and the role of our rising sea level in increasingly destructive storms. Are there ways to rebuild the shoreline’s natural defenses against hurricanes and flooding? Can coastal communities prevent catastrophic damage to people and property? Imagine flying through the air at the speed of light, leaping over tall buildings and seeing through walls with X-ray vision. For many, being a superhero is a childhood dream, and for Kosho Hoshitsuki, it was no different. As Hoshitsuki, a junior majoring in computer engineering, grew up, his dream of donning a cape and mask never came true. But thanks to a new club at Penn State, Hoshitsuki is one step closer to superhero status through virtual reality. Founded in fall 2015, the Virtual Reality Club gives students from a variety of majors hands-on experience with developing virtual reality (also known as VR) games and programs for such platforms as Oculus Rift and Google Cardboard.